We are in a hurry to inform you that we have added a new section – Online Marketing Plan. 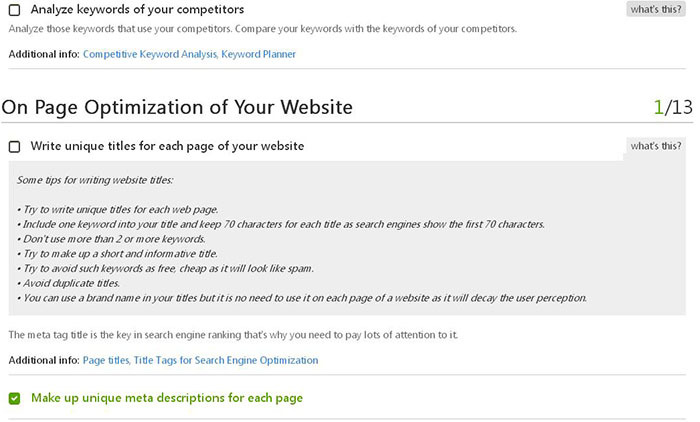 If you are a newbie, it will be an awesome step-by-step SEO guide. But even SEO professionals can use this guideline in order to show you what to do for your website promotion or just remind if you have missed something. In the Online Marketing Plan you can follow each point what you should do to make your website get high rankings (you can check site rankings with SE Ranking), get more real customers and be recognizable among your target audience. Each item in Online Marketing Plan means the way that can help you make your website well-optimized. You will find there a more detailed information and reliable resources on authoritative website about a certain topic of your SEO activity.